defeat arch-rival Pakistan by 124 runs through Duckworth-Lewis (D/L) method in a one-sided Champions Trophy encounter at the Edgbaston Cricket Ground here on Sunday. Amidst the happy crowd was the face Bollywood fans in and outside India have grown up watching and loving - megastar Amitabh Bachchan. Big B, who was an attendee of the high-octane clash, later took to Twitter to express his elation over the victory. Livewire actor Ranveer Singh was also one of the high-profile guests at the match. Ranveer's wishes to Team India was quite akin to his flamboyant personality. He tweeted, "What a match the boys played! Scintillating all round performance! Banging start to the tournament! 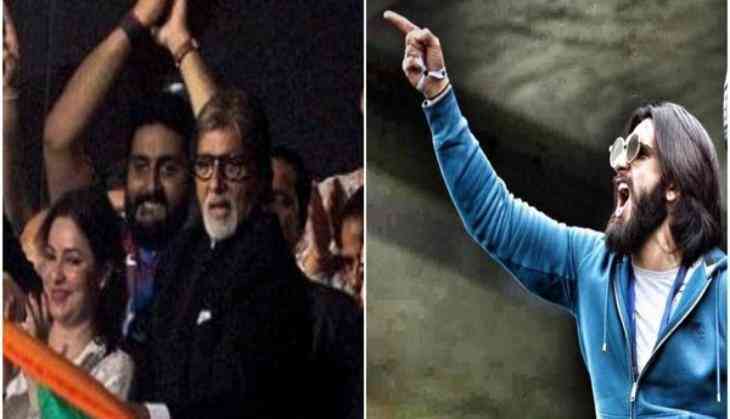 The India vs Pakistan match had Twitter abuzz with stars like Big B, Abhishek Bachchan and Ranveer taking time off to wish Team India luck on Twitter. Headlining the guest-list at Edgbaston was legendary cricketer Sachin Tendulkar, along with his wife Anjali. Actor Dhanush later took to Twitter to post a picture with Tendulkar. Pakistan were eventually bundled out for 164 for 9. Umesh Yadav was the pick of the bowlers for India as he finished with the figures of three for 30 while Ravindra Jadeja and Hardik Pandya took two wickets each. Bhuvaneshwar Kumar also chipped in with a wicket. Earlier, put in to bat first, openers Rohit Sharma (91) and Shikhar Dhawan (68) provided their side with a perfect start as not only did they blast half-centuries each, but also went on to stitch a huge 136-run stand, thus making them the most successful opening pair in the history of the eight-team marquee event. Yuvraj was declared 'Man of the Match' for his brilliant batting performance. The Kohli-led side will now lock horns against Sri Lanka at the Kennington Oval in London on June 8.